It is with great pleasure that I announce the keynote speakers for Convocation at CAA’s Centennial Conference in New York: the artists Helen Mayer Harrison and Newton Harrison. This event, free and open to the public, will take place in February 2011. The Harrisons are interdisciplinary, collaborative, multimedia, environmental, educational, activist, visionary, ethical, and humane. They exemplify many aspects of contemporary artistic practice and speak to numerous concerns of the CAA membership. I first met Newton in the early 1990s: he was a visiting artist when I was a graduate student in Indiana. (I also met Helen years later at a gallery reception in Colorado.) He left a tremendous impression on me as someone with a truly perceptive mind, possessing the foresight, talent, and determination to create visually compelling art on a scale that makes a positive difference in life on our planet. The Harrisons have been doing this for over forty years. His and Helen’s concept of the individual contributing to the elevation of a collective “conversational drift” resonates today more than ever. For more information on the Harrisons and their work, please visit their website. 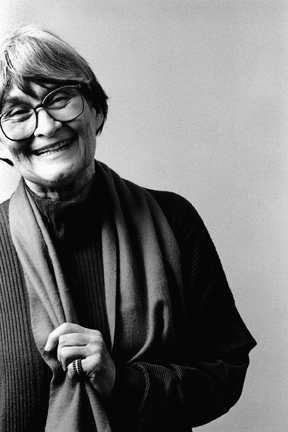 Other great sources include the New York Art World, Ronald Feldman Gallery, which represents the artists, Left Matrix, and the Community Arts Network, which republishes an essay on the artists by Arlene Raven. I’d like to thank Sue Gollifer, CAA vice president for Annual Conference, for her thoughtful consultation with me about potential speakers, and Emmanuel Lemakis, CAA director of programs, for his assistance with confirming and making arrangements for our honored guests. Please join me in welcoming the Harrisons and spreading the word about our good fortune to have them address CAA as keynote speakers for our 2011 Convocation. The July 2010 issue of CAA News just been published. You may download a PDF of it immediately. Introduced by Andrea Kirsh, CAA’s vice president of external affairs, the July newsletter brings you up to date on all CAA programs and services. 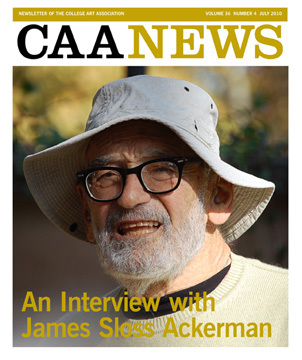 It also includes an interview with James Sloss Ackerman, a celebrated professor of Renaissance architecture, and updates on the future of the Bibliography of the History of Art. In addition, the July issue solicits your participation in the two upcoming Centennial Conferences in New York (2011) and Los Angeles (2012). For Los Angeles, CAA continues to accept your session proposals through an online process, and an article provides full details on the process. For New York, CAA invites artists to submit video documentation of performance work for the ARTspace Media Lounge, and the organizers of several panels—on Damien Hirst, the future of art history, and health and safety in the artist’s studio—want to hear from you. The CAA News managing editor welcomes your submissions to the Endnotes section of the next issue. Please send listings for recent solo exhibitions, books published, and exhibitions curated, as well as news about your new position or your grant or fellowship, to Christopher Howard. Deadline: August 13, 2010. The latest development at Brandeis University, which early last year decided to close the Rose Art Museum and sell its prized collection of modern art, is to lease works from its collections through a partnership with the auction house Sotheby’s. Selling works from the museum to alleviate the school’s recession-shattered endowment, critics say, is not off the table. The Rose collection ranges from classics by Willem de Kooning and Robert Rauschenberg to more recent works by Dana Schutz, whose first museum exhibition was held at the Rose in 2006. Geoff Edgars, also of the Boston Globe, offers recent precedents for the Rose’s controversial move: the Whitney Museum of American Art in New York, the Museum of Fine Arts in Boston, and the High Museum of Art in Atlanta have all rented artworks to other museums and institutions. In addition, last week Brandeis announced the hiring of a new president, Frederick M. Lawrence, dean of George Washington University Law School. He will fill the position to be vacated by Jehuda Reinharz, who was responsible for the ill-fated idea to close the museum and sell its art, in January 2011. Each month, CAA’s Committee on Women in the Arts singles out the best in feminist art and scholarship from North America and around the world. CWA Picks may include exhibitions, conferences, symposia, panels, lectures, and other events. The following selections should not be missed. The Dorothy Series (1975–79) by June Wayne was created in a hyperrealist style using photographs, documents, and scrapbook memorabilia. The artist created the set of lithographs to narrate the life of her mother, Dorothy, who raised her as a single parent, had a successful sales career, and staunchly campaigned for women’s rights. The Dorothy Series was created in collaboration with Ed Hamilton of Hamilton Press. Born in 1918 in Chicago, Wayne had her first solo exhibition in 1935. 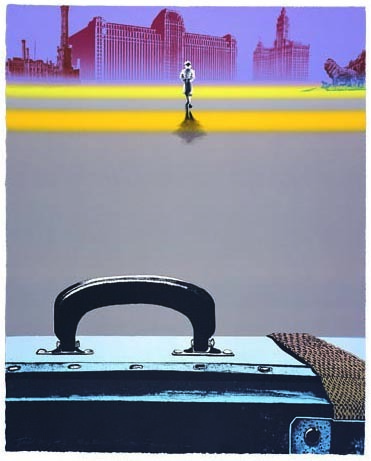 A participant in the Works Progress Administration Easel Project in Chicago, she later moved to California where she studied lithography and founded the Tamarind Lithography Workshop in 1960. The CWA honored Wayne with an Annual Recognition Award in 2002. In the early 1970s, Sally Potter made avant-garde short films before moving on to experimental dramatic features that incorporate music, literature, dance, theater, and performance. She typically works on multiple elements of her films, from script and direction to sound design, editing, performance, and production. Potter’s films elegantly blend poetry and politics, give voice to women’s stories and romantic liaisons, and explore themes of desire and passion, self-expression, and the role of the individual in society. Films included in the program are her low-budget short, Thriller (1979); her first feature, The Gold Diggers (1983); Potter’s most critically acclaimed film, Orlando (1992); and RAGE (2009), her most recent project. Several prominent organizations from Seattle’s glass art community are collaborating to present “The Brychtovà Forum – Women Artists Working in Glass: Celebrating Innovation and Vision Across Generations,” a four-day series of free lectures, panel discussions, and events to be held July 15–18, 2010. The forum was conceived to celebrate the rich tradition of women working in glass while also recognizing the life and work of one of the most important artists in the history of the glass movement. Jaroslava Brychtovà’s lecture, the cornerstone of the Brychtovà Forum, will be presented at the Seattle Art Museum on Thursday, July 15, accompanied by a new documentary by the Czech filmmaker Jiri Malek. The lecture will be followed by a reception and special exhibition curated by Sarah Traver opening across the street at the Traver Gallery. Panel discussions organized by three generations of leading glass artists—including Flora Mace, Shelley Muzylowski Allen, and Rebecca Chernow—will be presented at Seattle Art Museum throughout the day on Friday and on Saturday morning, all of which will be free and open to the public on Saturday afternoon. Also on Saturday afternoon, a glassblowing demonstration will take place at the Pratt Fine Arts Center (1902 South Main Street, Seattle, WA 98144; 206-328-2200; info@pratt.org). Admission to forum events is free but seating is limited; tickets will be available on a first-come, first-served basis upon registration. According to a new report published by the National Endowment for the Arts (NEA), Americans who participate in the arts through the internet, television, radio, computers, and handheld devices are almost three times more likely to attend live arts events than nonmedia participants (59 percent versus 21 percent). Users of technology and electronic media also attend, on average, twice as many live arts events—six versus three in a single year—and see a wider variety of genres. 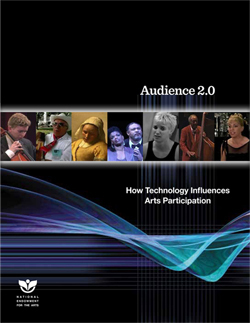 Audience 2.0 expands on the research published in the NEA’s 2008 Survey of Public Participation in the Arts (SPPA). This survey, conducted in partnership with the US Census Bureau and released last year, is the nation’s largest, most representative study of arts participation among American adults. Since 1982, SPPA has measured American adult participation in activities such as visits to art museums or galleries and attendance at jazz and classical music concerts, opera and ballet performances, and musical and nonmusical plays. SPPA categorizes these as “benchmark” activities, providing a standard group of arts activities for more than two decades of consistent trend analysis. Audience 2.0 takes a closer look at how audiences use electronic media to engage in these benchmark activities. In an agency first, the new report is being released only in an electronic format that includes multimedia features. Chairman Rocco Landesman’s video greeting is accompanied by a video commentary on the report from Sunil Iyengar, NEA director of research and analysis. Additionally, each chapter will open with videos from arts organizations that represent each of the benchmark disciplines tracked by the report. Arts organizations can use findings from Audience 2.0 to better understand their audiences’ uses of technology and electronic media. As part of its ongoing analysis of SPPA data, the NEA is making raw data and detailed statistical tables available to researchers and the public. The tables highlight demographic factors affecting adult participation in a variety of art forms.